Although a polycarbonate body is generally considered to be inferior to a magnesium-alloy structure, the EOS 550D feels pretty tough. I was unable to make it produce any creaking sounds when I gripped and squeezed it, and there was no sign of any give along the joints. The control dial and buttons also have a fairly high-quality feel and are responsive. While I usually attach a strap to a camera, I prefer to carry a camera in my hand where possible and the deep textured finger grip and pronounced thumb groove of the EOS 550D make this very comfortable. In fact, during one phase of this test I carried the camera in this way between shots for around four hours without feeling the need to give my hand a rest. As the EOS 550D is at the top of Canon’s entry-level DSLR line, rather than at the bottom of its enthusiast collection, it doesn’t have the large thumb wheel or mini-joystick on its back like the EOS 7D has. This means that the AV button must be used in conjunction with the small dial at the front of the top-plate to select the aperture setting in manual exposure mode or apply exposure compensation. This isn’t a major hardship, but I miss the ability to select the AF point quickly using a joystick. Instead, EOS 550D users must press the AF point selection point button above the thumb rest and then use the navigation buttons. As a left-eye user, I find these buttons a little awkward when looking through the viewfinder as I have to squeeze my thumb between my nose and the camera. It’s not a problem that is exclusive to the EOS 550D, though. 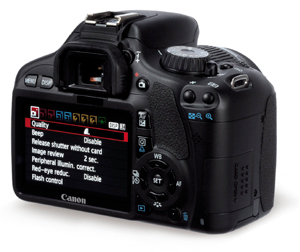 Like Canon’s other DSLRs, the EOS 550D has a well-organised menu that is divided into tabbed sections. This makes it quick and easy to locate the desired feature. I find the My Menu screen, which can list up to six user-selected menu options, very useful. I use it to access the Auto Lighting Optimizer (ALO), custom white balance, Highlight Tone Priority (HTP), mirror lock-up, Live View function settings and format control. In addition, I opted to use the Set button to access the pop-up flash exposure compensation control. The EOS 550D has a Quick Control Screen display that is accessed by pressing the Q button just above the navigation controls. This displays the camera’s current settings (including the exposure mode, picture style, white balance, image quality and exposure settings) and allows all except the exposure mode to be selected and changed. Apart from the issue of selecting the AF point, I have no complaints about the handling or control layout of the EOS 550D. It appears to be well put together and is comfortable to carry and use. At 128.8×97.3x62mm and 530g, it is also smaller and lighter than the EOS 7D.